Apparently, there is an unofficial version of PwnageTool out in the wild which can jailbreak iPhone 3GS (with old bootrom and already pwned on 3.1.2) on the latest iOS 4 firmware. The creators of the original PwnageTool has confirmed that this version has been modified and redistributed without their permission, and most importantly, it doesn’t patches some important files which are required for the ultrasn0w unlock to work properly. I haven’t tried this tool, and wont recommend using this. I have posted this for informational purposes only. But if you want to give it a go, you can do so at your own risk by finding the download link here: (http://www.megaupload.com/?d=C3NUUE48). Also, iPhone 3GS users who are jailbroken using Spirit, and with new bootrom should avoid upgrading to iOS 4 until new jailbreak tools are available. In case you don’t know, this unofficial release is based on the work of KaatjeNL. You can follow her post here to see how the process is manually done. If you are an iPhone 3G, or an iPod touch 2G user, you can follow the complete step by step guide posted here to jailbreak your iOS device using Redsn0w, and then unlock it using Ultrasn0w 0.93 on any baseband (including 05.13.04 and 05.12.01). UPDATE 1: Ok guys, avoid this unofficial release of PwnageTool and follow the method posted below. This method uses custom bundles for PwnageTool and requires an already jailbroken iPhone on 3.1.2 and with old bootrom. Hacktivation is not working yet so you will need original carrier SIM to activate your iPhone. If you meet these requirements than you may proceed at your own risk. I will not be liable for any headaches, lost of productivity, lost messages, etc. Be aware as always, you many not be getting what you think if you are not grabbing the files directly from Apple. Ok so lets get started! Once you are done with this, simply open the PwnageTool 3.1.5 and follow the Step 1 to Step 7 as posted here, to create a custom iOS 4 firmware. Once you are done with the jailbreak, activate it using the original carrier SIM and then use the latest ultrasn0w to unlock it so that you can use it with any carrier you like. hey, i wanna get iOS 4. im running 3.1.3 snowbreeze 5.11.07 (i believe) with old bootrom 3GS. windows computer. i need to unlock. but since unlocking isnt an issue anymore with the new ultrasn0w i need to know how to jailbreak which will hacktivate as well… help please! But what if you don't NEED the ultrasnow unlock (having an already factory-unlocked iPhone 3Gs)? Is it safe then? when it coming any1 knows??? How do we use the microsoft terminal widnows..sorry im a big noob at this.. I AGREE WITH Nickaan1,old boot rom is old news now.Time to move on!! Hi all, I just went to the website 3GSUnlock.co.uk and unlocked my new iphone 3gs 4.0! Hope it helps you guys. I tried this and it doesn't work. You'll be stuck on the Apple logo and that's about it. Luckily, I have my restore info backed up on Saurik's server, so I'm restoring back to 3.1.3.
whats this fuze about? many cant activate the old mistaking update phones, here u guys posting something enough to kill a virgin with anticipation of what to come .. let the cat out of the bag, do we upgrade to 4.0 and unlock or we still stock with dead iphone 3GS 3.1.3 with firmware 05.12.01 ? I have an iPhone 3GS 3.1.3 with 5.12.01 baseband and the newer 6.4 bootloader. I've never activated it before so its just on the emergency call/itunes screen. Should i just go to at&t, get it activated, jailbreak/unlock it, and then cancel my plan the next day? I read somewhere that if you cancel within 3 days they even refund the activation fee – has anyone tried this? Dev team just released official version 10 min ago , just did mine working great ! 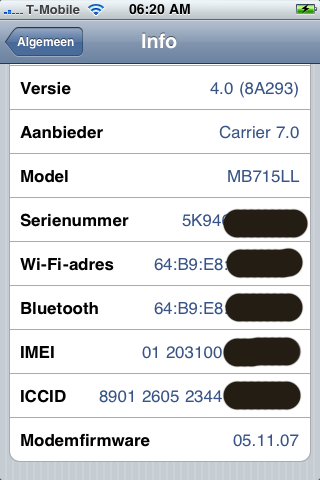 i have an iphone 3gs, 3.1.3, 5.12.01, it is “Factory Unlocked”. can i use this jailbreak with it? i have a ipod touch 2g PC model how do i go about jailbreaking it. i did have it previously jailbroken with spirit but since i updated the firmware on itunes i cant figure out how to jailbreak it again…. PLEASE HELP…..!!!! How do I Jailbreak my 3gs if it is running on 4.0 firmware and is not currently jailbroken? DUDE you just use Spirit and you're good to go EASY! Download spirit, it will jailbreak it in 15 seconds exacly! What do u guys suggest me to do? have an iphone 3g but upgraded it by mistake to 10.4.1 how do i jailbreak and unlock? How should I downgrade it to 4.0? Will i loose all my data such as pictures, songs and especially messages?